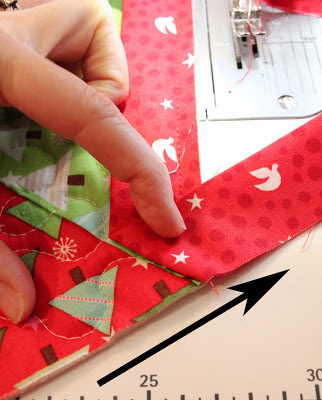 Please note: this is not a comprehensive tutorial for creating and adding binding to a quilt. 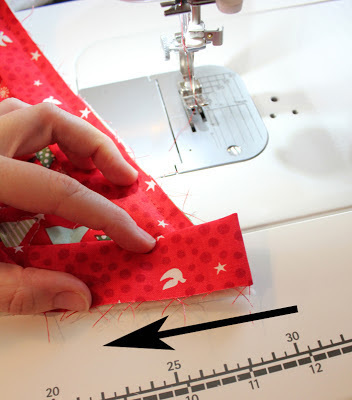 There are many wonderful online tutorials that cover all details for making binding (my favorite is here.) These are simply the steps I use to add binding specifically to my Christmas Tree Skirt. To purchase the Holly Jolly Christmas Tree Skirt pattern, go here, here or here. 1) Create your binding. For this project, bias binding is recommended, but a straight-grain binding will work fine. 2) Begin attaching binding, starting on one of the outside edges of the tree skirt. 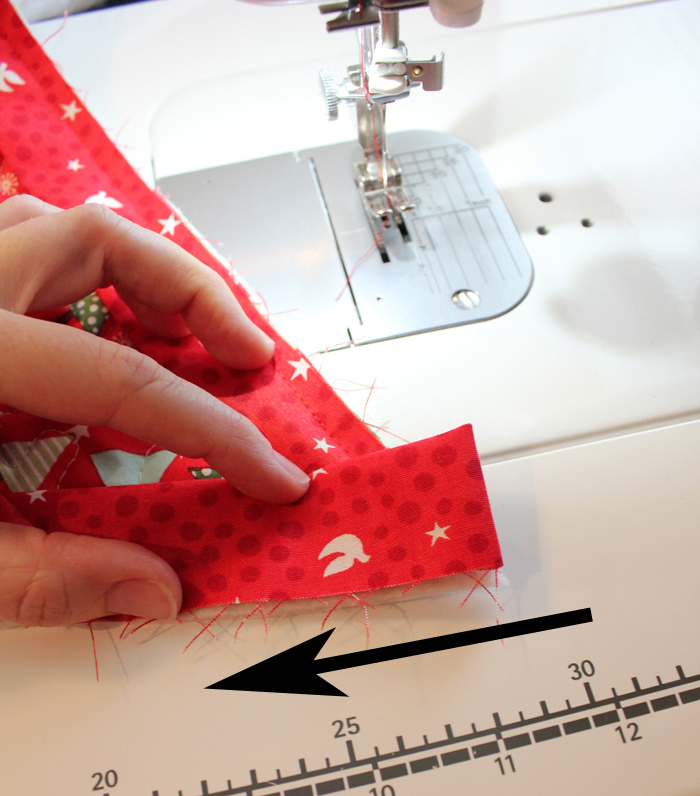 When you come near the first point on the skirt, stop sewing 1/4" before you get to the seam line. 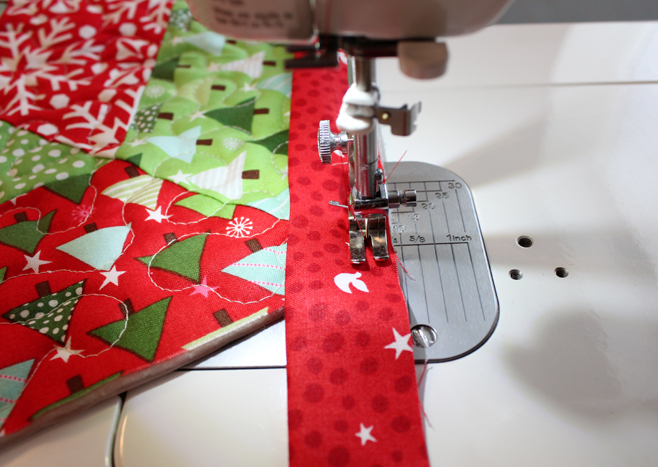 Back stitch and remove tree skirt from machine. 5) Starting at the edge of the fold, back stitch a bit and then begin stitching the next section of binding. 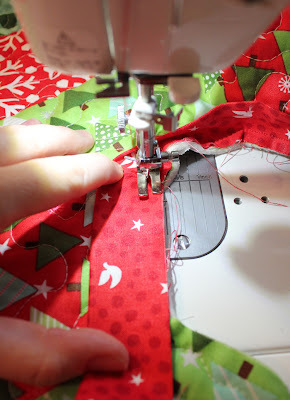 Repeat steps 2 through 5 for each of the outside points of the tree skirt. 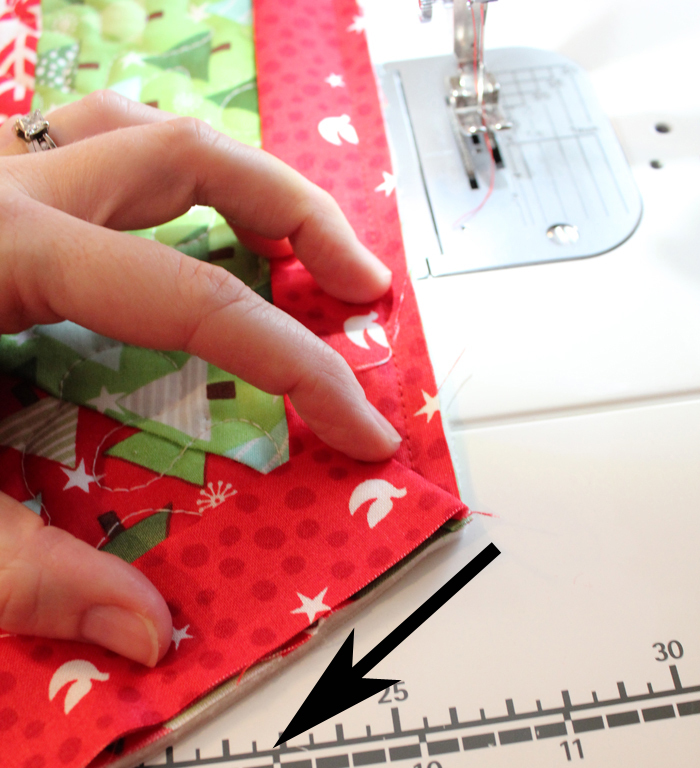 6) When you get to one of the points at the tree skirt opening, stop sewing 1/4" from the point. Fold binding strip back so that it is in line with the raw edge of the next section you will be sewing. 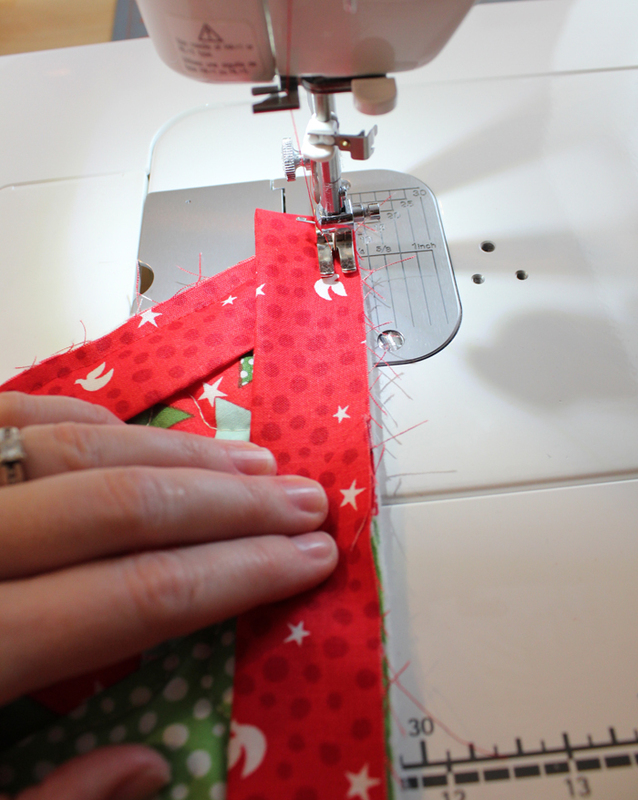 8) Starting at the edge of the fold and back stitching a bit, begin stitching the next section of binding. 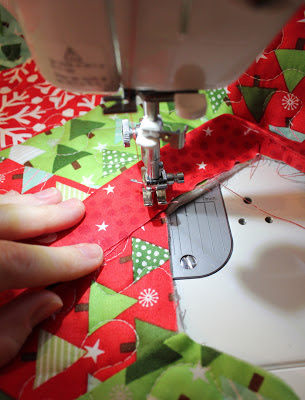 11) Lower presser foot and begin sewing next section. Repeat at each concave point in the tree skirt center opening. 12) When you get back to your starting point, join ends of the binding. 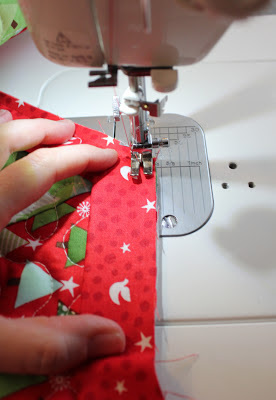 Now that your binding is attached to the front of the tree skirt, I recommend that you hand stitch it to the back. Machine stitching it is possible, but might prove to be challenging around some of those concave points in the center opening. Have questions? Leave a comment or shoot me an email! The pattern for the Christmas Tree Skirt is available in my pattern shop and my etsy shop (both are pdf versions). I just purchased your pattern. Thank you for publishing. Would you happen to have a general idea of the length of bias tape needed? 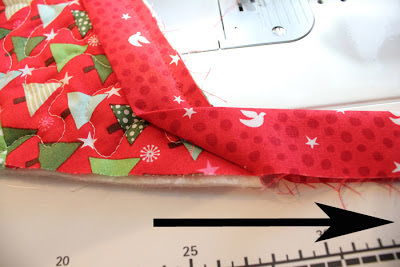 beginner question - I only know bias tape use as inserting the edge into the fold then sewing... for this I would sew the edge to the top of the skirt then fold over and hand sew to the back? Probably my poor quilting knowledge. I found it easier to make a paper pattern to cut out the panels. That way I only had to measure once.